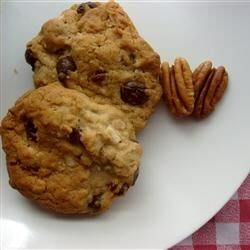 "I was cleaning out my kitchen cabinets and found several ingredients which needed to be used up and I came up with these chewy, coconut, oatmeal, chocolate chip, pecan cookies. " In a large bowl, cream together the butter, shortening, white sugar and brown sugar until light and fluffy. Beat in the eggs one at a time, then stir in the evaporated milk and vanilla. Combine the flour, baking powder, baking soda and salt; stir into the sugar mixture. Mix in the oats, chocolate chips, coconut and pecans. Drop by rounded tablespoonfuls onto the prepared cookie sheets. Cookies should be spaced about 2 inches apart. Bake for 13 to 15 minutes in the preheated oven, until golden brown. Cool slightly on cookie sheets before removing to wire racks to cool completely. I have made a similar recipe, basically without the milk which I think makes them more "cake" like. I would make them again but without the milk.